A proposal to develop a prime downtown parcel just blocks from Concord BART with a mix of housing and retail was voted down by the Concord City Council Tuesday night. Every councilmember and the mayor expressed desire to develop the space at 1765 Galindo Street, but they collectively questioned, “At what cost?” In the end, the city chose to prioritize union labor and affordable housing over promised cash payments developer AvalonBay Communities had offered. The developer had brought back a plan to build 310 units of housing and 6,500 square feet of retail on a three-acre downtown parcel dubbed the “white picket fence” lot. A Masonic Temple once stood on the land before the whole building was literally moved to another location in 2013. The property has been a dirt plot bordered by a white picket fence since. After two years of discussion and proposals, Nathan Hong of AvalonBay presented yet another revised plan that threw a potential $1.1 million into the city’s community benefit fund but failed to meet the 15 percent prevailing wage Project Labor Agreement the council asked them to consider at the last hearing. The parcel sits three blocks from Concord BART and two blocks from the city’s central square at Todos Santos Plaza. The plaza is a vibrant area, home to restaurants and pubs and surrounding a park with a stage that hosts farmer’s markets, kid and beer fests alike. In other words, AvalonBay was about to score the development deal of the century — until they didn’t. Nik Wojcik/SFBay A sketch of AvalonBay Communities proposal for a three-acre parcel on Galindo Street is seen during a Concord City Council meeting in Concord, Calif., April 8, 2019. 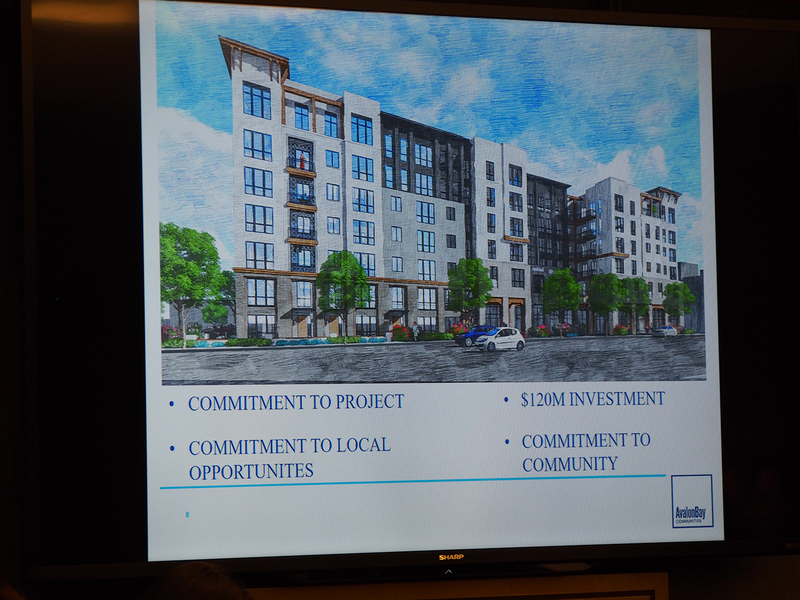 AvalonBay had proposed eliminating five planned low-income affordable housing units and reducing retail space in exchange for monetary contributions to the city. Another workaround to the prevailing wage request was to offer to contribute 15 percent of total construction cost at the project’s completion. Neither of these solutions sat right with councilmembers Tuesday. Councilmember Tim McGallian was “troubled” by the developer’s inability to meet the prevailing wage mark and expressed further concern about a “division of labor” sowed throughout the long proposal process, further noting such division only serves to benefit the developer. On one side of the chamber, backed by a group of about 25 members of the organization Carpenters in Action, was a developer who wanted nothing more than to advance a project years into negotiations. On the other side sat members of trade unions representing plumbers, steamfitters and electricians. 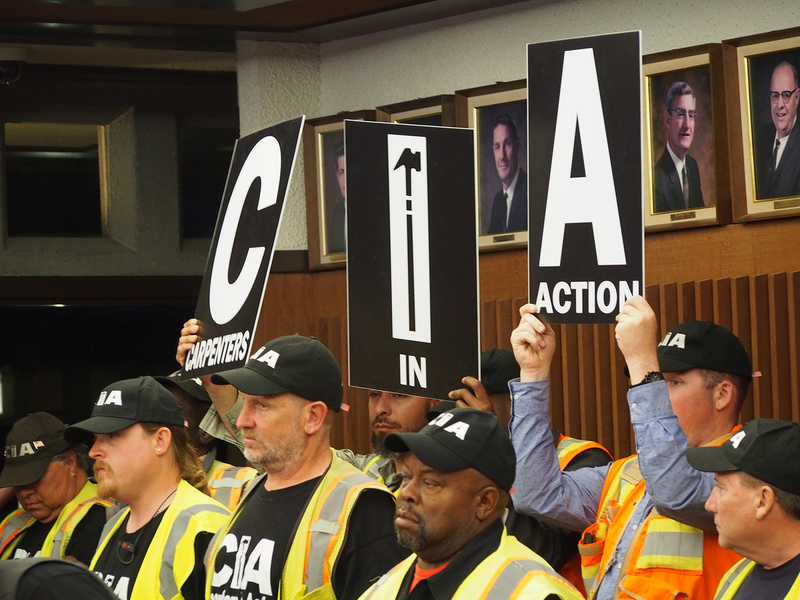 Nik Wojcik/SFBay Members of Carpenters in Action stand to support the AvalonBay Communities development proposal at a City Council hearing in Concord, Calif., April 8, 2019. The city council sat in the referee’s seat, attempting to balance housing and development priorities against needs of working-class residents and local craftspeople. They sat and attentively listened to both sides. 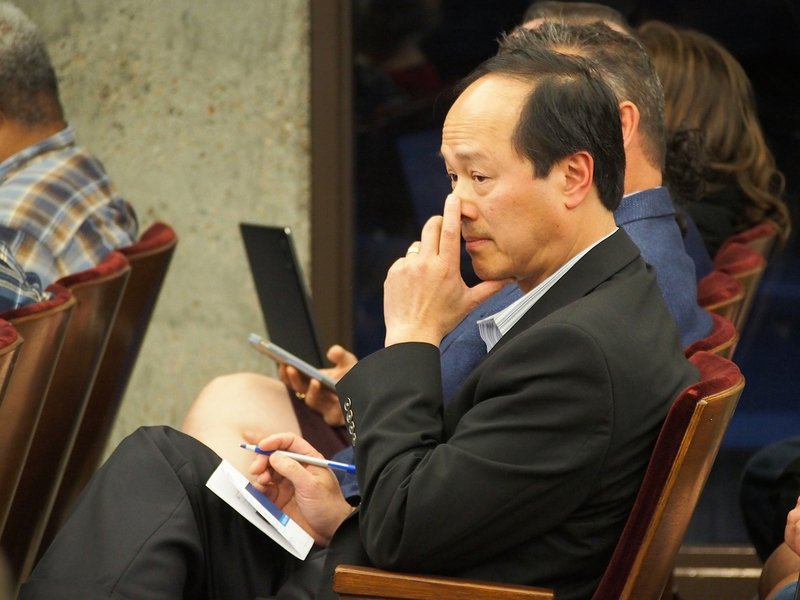 Nik Wojcik/SFBay Nathan Hong of AvalonBay Communities sits in the City Council chamber during public comments about the proposed development on Galindo Street in Concord, Calif., April 8, 2019. Each council member and the mayor withheld support for a project they would in actuality prefer to see completed, although Councilmember Laura Hoffmeister was reluctantly leaning toward approval until the bitter end. 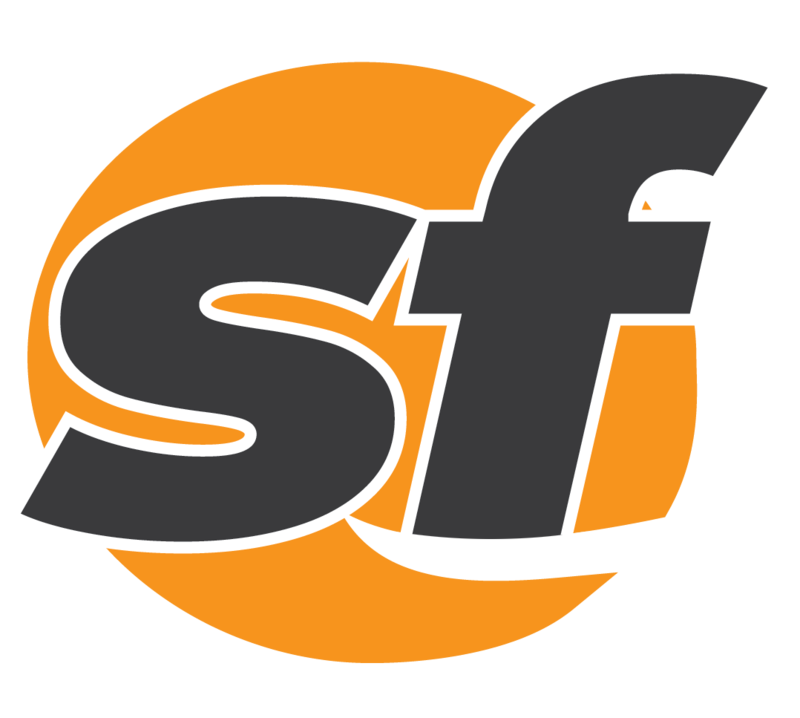 Each gave their own given reasons for the rejection, but they collectively agreed that a local labor workforce agreement and affordable housing units need to be incorporated into future plans. In a unanimous vote, members of the council voted Tuesday to hold the line.